They’re taking the bike out of bike share. It wasn’t much more than a year ago that dockless bikes — the kind you rent for a half-hour or so to pedal to your destination — were the new tech innovation that were going to transform urban mobility and make millions for their venture capital investors. But cities around the country have already started switching from the heavy bikes to the Next Big Thing: pedal-assist e-bikes and e-scooters. In Seattle, Lime has informed city officials that its new contract will only offer e-bikes and e-scooters, starting in 2019, the Seattle Times reported. In Washington, D.C., dockless pedal bikes have all but vanished. Mark Sussman at Greater Greater Washington reports that 96 percent of the dockless pedal bikes in metro Washington have disappeared, partly as a result of MoBike and ofo pulling out of the country this summer. Spin packed up in August, but says it will return with e-scooters. Jump still has a few hundred pedal bikes in D.C, but they’re e-assist and it’s a small fraction of what four companies were providing just a few months ago. Dallas, which had a fleet of 18,000 bikes, lost them almost overnight. In August, Texas Monthly, in its obituary for the “deeply flawed” one-year experiment, showed thousands of bikes piled in a recycling center. Camden’s bike share was initially seen as a big bike share equity success, but ended up a complete flop when, ofo, the only provider, went belly up. In Chicago, ofo pulled out and Lime and Jump only offer e-bikes. The only company still ordering pedal dockless bikes is Pace, which has about 350 bikes. In Boston, Spin ended its dockless bike plans before it even started, announcing in July that it was switching to e-scooters. Simply put, electric vehicles such as e-bikes and scooters are just more popular than traditional bikes, micro-mobility firms say. E-bikes are twice as popular as pedal bikes, Lime told the Seattle Times. And e-scooters are even more popular, having been checked out five times more than pedal bikes in their same markets. The companies also blame government regulations. Many cities put caps on the number of total vehicles a company can provide. And companies are responding by shifting to the more-popular modes. Seattle limits each company to 5,000 devices, for example. But even in Seattle, which had no public competitor and a relatively strong cycling culture, ridership for dockless pedal bike share was underwhelming. Data showed dockless pedal bikes were only being rented an average of 0.85 times a day — well below what we see in high-performing public bike share systems. In contrast, docked bike share is still doing well, showing relatively strong year over year growth. In New York City, for example, the dock-based Citi Bike system remains popular and makes a profit, despite no public subsidies. But like many cities, New York, hit the pause button on its docked monopoly, offering pilot programs so officials could see which companies might emerge with a better system — or not (Boston was one notable exception). Pace didn’t last in New York City. 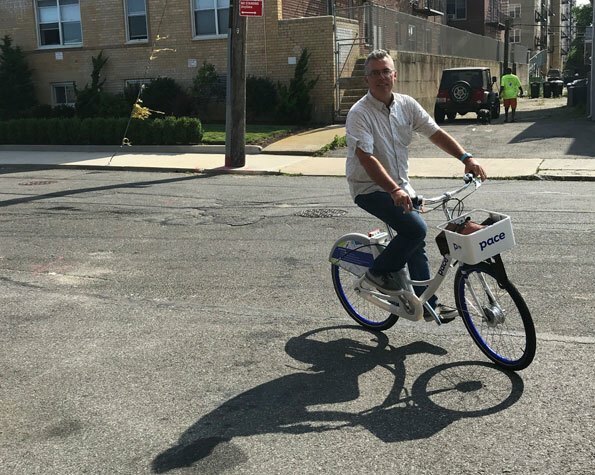 “We are finding they are having difficulty keeping the number of bikes we’ve authorized,” NYC DOT Commissioner Polly Trottenberg told my Streetsblog colleague Gersh Kuntzman two months ago, in the middle of a pilot dockless program that included failures of one kind or another by ofo, Jump, Lime and Pace. As Trottenberg suggested, cities faced a risk in outsourcing bike share to private firms motivated by profit — especially when many of them, such as ofo, didn’t stick around. For now, it appears, the only future in micro-mobility is e-bikes or e-scooters. Correction: Original article misstated which bike share company pulled out of the Boston area. It is Spin not Lime. Worth noting that the original (institutional) pioneer for dockless bikes is still operating – Deutsche Bahn’s Call A Bike, since Y2K. The central advantage of dockless bikeshare is not having docks that can cost 2-3 times what the bike itself costs. I’d be curious to find out why Pace is failing in NYC. Here in Montreal, you still have bikes that were rolled out 9 years ago operating (though the bikes are only operated 7 months a year, but they see a lot of ridership). More likely, the problem is that operators went for a penny wise, pound foolish approach to the bikes themselves, and then got tanked by vandalism, low ridership, and early vehicle failures. Plus, they don’t limit themselves geographically to the higher ridership areas like docked systems usually do. Fundamentally, people will ride bikes(hare) if it’s safe, convenient and affordable. For profit companies are going to chase whatever gives the highest, fastest payback, and for right now that’s scooters. But I think scooters, with their rapid takeup, will ultimately create more space for bikes. I’m happy to see some experiments, but I look at it this way. Most bike trips are anchored by work, home, or other places visited regularly. One gets used to where the docks are near these locations. Without them people won’t have confidence a bike will be there. If it is an optional substitute for mass transit it’s one thing, but if it’s your primary mode forget it. That’s not a concern where bikes are abundant, as in China, where tens of millions of rides occur daily. A note: Social Bicycles became Jump, and Uber bought Jump. They still have the Social Bicycles branding on the services that launched with it (e.g. https://santamonicabikeshare.com/), but otherwise seem to be expanding under the Jump name; but, they seem to be using the same backend for accounts, as I discovered when I downloaded the Jump app upon their arrival in Santa Monica and found that I could log in with my SoBi account that I created when I had a Breeze account. So if you’re looking specifically for SoBi, that could account for the lack of expansion you’re seeing. Incorrect that SoBi penalized users for not parking at hubs. They offered a small incentive/credit for parking at hubs. JUMP is offering an incentive/credit for parking at drop zone or charging hubs, at least in Sacramento and San Francisco. Yeah, I think cities really strangled this one in the crib by limiting the number of bikes so heavily. SoBi charges fees of a couple of dollars for not parking at a hub. Shown below, $2, Breeze of Santa Monica. When an annual subscription costs $99 a year, so rides cost a coin, $2 is a lot. I stand corrected. It has changed since the last time I used the Santa Monica et.al. (Bike Share Connect) system. When’s the last time you used it? That’s how it was for me when I tried it two years ago, and it started not too long before I signed up. While I’d rather just not have the out-of-hub fee, it’d be far less onerous if they’d at least equalize the out-of-hub fee and the credit for returning one to a hub. Last August, but I have a per-ride membership, which might be different, and I usually used hubs so maybe I didn’t notice. Not sure now. Dockless bike share platforms aren’t in the business of providing bicycles. They’re in the business of harvesting, monetizing, and selling personally-identifiable user data — from app-compatible smartphones, GPS-equipped bicycles, and credit/debit cards. This is totally consistent with both Lyft’s and Uber’s business model. With a dock based system there is no guarantee that there will be a bike near your starting point or an empty dock near your destination. Both types of systems depend on balancing. Bikeshare bikes are so heavy and inefficient that riding bikeshare e-bike feels similar to riding a good quality pedal bike. Riding a non-e-assist bikeshare bike up a hill is a slog. The app tells me, plus you get pretty good at knowing the liklihood of bikes and empty docks, but I’m spoiled, I’m in Boston. I do wish you could save a bike for up to 5 minutes as I have literally walked toward a station with 2 bikes, 4 minutes away and I got there and both bikes were gone. It only happened once. It’s weird that American cites, that have practically destroyed themselves for cars, are panicking because of a few bikes. Plus, they’re now owned by the #1 bike lane offenders in these parts, so I cannot in good conscience patronize them, nor their competitors who are owned by the #2 bike lane offenders. This is anecdote, not data, but my experience with Motivate / Lyft in NYC: when I get to a Citibike site with with either no bikes (and I want a bike) or no docks (and I want a dock), merely waiting a few minutes — less time than it would take to get to another station — fills the gap. More frequently than not, this affords the opportunity for a casual pleasant chat with … strangers. Shocking! Worth adding: this pertains to stations toward the middle of the service area. I’m sure the story is different on the fringes. For what it’s worth, Buffalo’s bike share system is dockless and I haven’t heard of any problems with it.